"Houston Chinatown at your fingertips"
The origins of traditional Chinese painting reach far back into China's distant history. Generally speaking, works dating from before the T'ang dynasty (618-907 A.D.) are mainly line drawings of people engaged in various activities; this was the "golden age" of human figure drawing. By the mid-T'ang dynasty, landscape and flower-and-bird paintings began their rise to prominence. Paintings of mountains, forests, fields, and gardens have the ability to transport one away from the vexations of the material world into a peaceful, carefree realm. Because of this, landscape paintings have always been highly regarded by China's literati and officialdom. The flowers, grass. trees. stones, and birds and other animals depicted in the lively and energetic flower-and-bird paintings are also widely admired. Thus the landscape and flower-and-bird types of painting, together with the earlier human figure painting, comprise the three main categories of traditional Chinese painting. The ruling and elite classes of the T'ang and Sung (960-1279 A.D.) dynasties were major supporters of Chinese painting. The creative aim behind artistic works produced in this period was more serious, and had political and educational significance; in style, the works tended to be elaborate and ornate. The Sung dynasty court established a fairly well systematized academy of painting. Sung Emperor Hui Tsung, a lover of fine art and painting, and an accomplished artist in his own right, granted special patronage to the painters in this academy, and sponsored the training of promising painters. The academy of painting reached the zenith of its activity in this period. However, because of gradual, social, economic, and cultural changes, more and more men of letters began to take up painting, and literature came to exercise an ever-increasing influence on painting. By the time of the famous Sung poet Su Shih, the school of literati painting had already emerged. By the Mongol Yuan dynasty (1271-1368 A.D.), there was no longer a formal painting academy organization within the imperial palace, so the court style of painting declined. 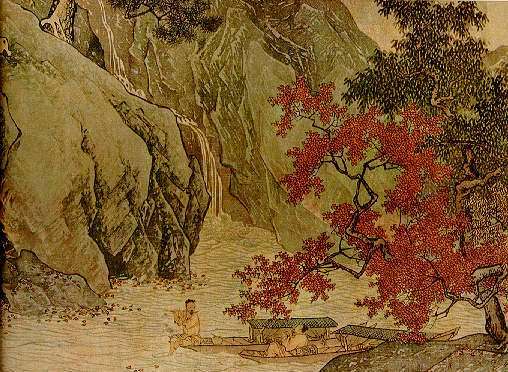 At this point, the literati school of painting entered the mainstream, and the leadership in Chinese painting circles fell into the hands of literati painters. Literati typically prefer to paint according to their own fancy and without restriction, and advocate a fresh, free, understated, and elegant style. Subject matter they are fond of includes mountains and rocks, clouds and water, flowers and trees, the "four gentlemen" (plum blossoms, orchids, bamboo, and chrysanthemums), and so forth. Because natural objects such as these are less demanding subjects to paint than the human figure, the painter can better exploit the brush and ink's potential for free expression. Whether Chinese painting is "realistic" is the object of frequent debate. Some may feel that it is not realistic, but such an answer tells only part of the story. Realism in Chinese painting reached its climax in the painting of the T'ang and Sung dynasties. However, the kind of "realism" sought after in Chinese painting is not an objective reflection of the existence of an object as perceived through the sense of sight, but rather is an expression of a subjective kind of recognition or insight.